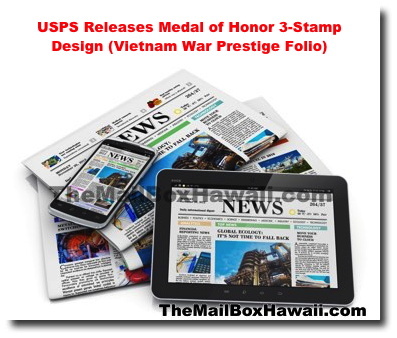 The United States Postal Service recently issued a Medal of Honor Stamp Folio in honor of all the individuals who were awarded the Medal of Honor for their valorous actions during the Vietnam War. The folio displays photographs of the 48 living recipients of the Medal of Honor from the Vietnam War who agreed to be part of this issuance. There are a total of 24 Forever Stamps on the collection, with 3 different designs - one for each version of the Medal of Honor: the Army, the Navy, and the Air Force. One page also features an alphabetical listing of those individuals who agreed to be included and also the deceased Medal of Honor recipients from the Vietnam War.